Playing area is third largest (behind Melbourne and Gaddafi Stadium, Lahore) of any Test ground . 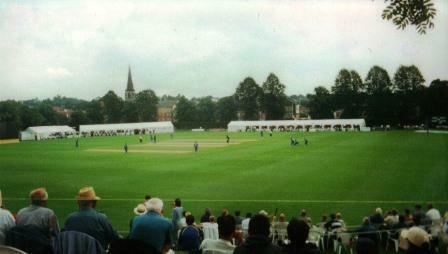 Best views from Pavilion or Peter May Enclosure to east of ground. Used to be cold, damp, decaying concrete but greatly improved for the 1999 World Cup, due for big future investment at both the Pavilion and Vauxhall ends (which will increase capacity from 18,500 to 24,000), The Surrey Tavern pub has now gone and so has the cramped, dingy passage between it and the Pavilion, but the iconic gasometer built in 1847 is now Grade II listed. 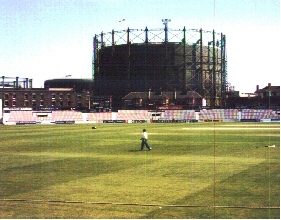 The Vauxhall end now has a big covered area with plenty of space for concessions, though these concessions not in use for County Championship matches. Still a cauldron in late August for the final Test of a series. Next to Oval Tube, half a mile from Vauxhall main-line station and Tube. 3/4 mile from station. Across the river Wey then along Woodbridge Road. Excellent food and beer tents, staffed by volunteers. Whitgift School. Brighton Road. 1 1/2 miles from East Croydon station (follow the tramlines west to the High Street, then due south), 2 miles due south from West Croydon Station, 1/2 mile west from South Croydon station. 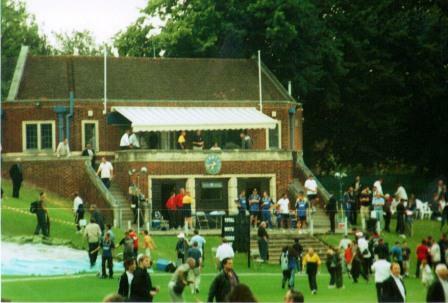 Whitgift School in "Sarf Croydon" may not have the same social cachet as Cheltenham College, Gloucestershire, but it is very pleasant with marquees in front of the trees that ring the ground, and a battlemented tower on the wooded skyline (actually a Victorian water tower). 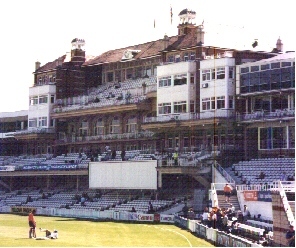 The non-marquee spectators sit on a steep bank above the ground. Cross the Brighton Road and a few yards along Junction Road is the "Crown and Sceptre" pub. Not used by Surrey for the last few years.